Eastern senior Jess Parker (2) drives toward the basket, during the Lady Eagles’ 53-43 victory on Thursday in Tuppers Plains, Ohio. TUPPERS PLAINS, Ohio — Now that’s saving your best for last. 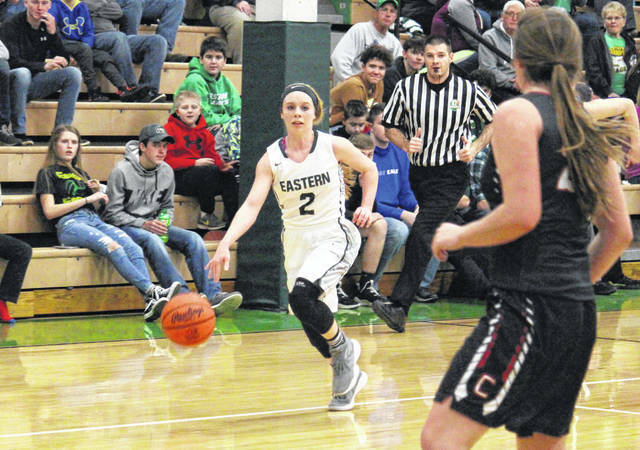 The Eastern girls basketball team trailed visiting Trimble by one point headed into the fourth quarter of Thursday’s Tri-Valley Conference Hocking Division tilt at ‘The Nest’, but the Lady Eagles roared back to take the 53-43 victory, scoring two dozen points and pulling in seven defensive rebounds in the final eight minutes. Trimble led initially and got out to a 7-4 lead 5:20 into play. The Lady Eagles (10-6, 9-2 TVC Hocking) — reaching double-digit wins for the 11th consecutive season — scored the final five points of the first quarter and headed into the second with a 9-7 edge. 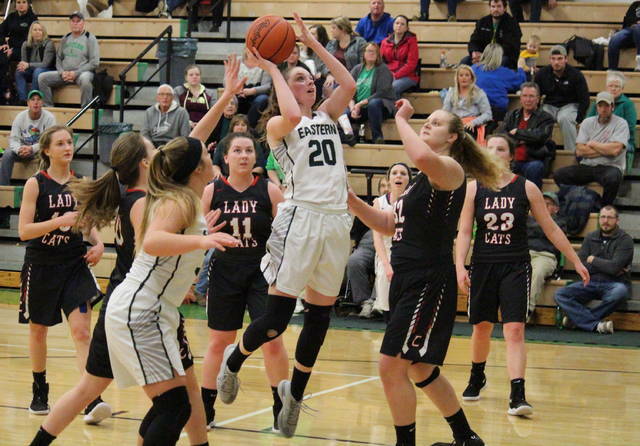 The Lady Tomcats regained the advantage with a 10-to-5 run to start the second period, but Eastern scored six of the final eight points in the half and took a 20-19 edge into the break. EHS tied the game twice before regaining the lead at 27-25 with 4:10 left in the third quarter. The hosts took the edge back at 29-28, but Trimble scored the final bucket of the stanza and headed into the fourth with a 30-29 advantage. Eastern went ahead 33-30 with back-to-back baskets to start the fourth, but the Lady Tomcats tied it up with a three-pointer. The Lady Eagles answered with a three-pointer of their own and didn’t relinquish the lead again, ending the contest on a 20-to-10 run. Following the 53-43 victory, Eastern head coach Jacob Parker was thrilled at the way his team finished the night, particularly on the boards. “If we play like we did tonight in the fourth quarter, we’re a good basketball team,” Parker said. “That energy and everything we did in the fourth quarter, that was the most fun I’ve had all year. We looked like a darn good basketball team. The Lady Eagles shot 22-of-54 (40.7 percent) from the field, including 3-of-15 (20-percent) from three-point range, while the Lady Tomcats made 15-of-45 (33.3 percent) field goal attempts, including 3-of-11 (27.3 percent) three-point tries. At the free throw line, EHS was 6-of-14 (42.9 percent) and THS was 10-of-15 (66.7 percent). Trimble won the rebounding battle by a 37-to-25 count, including 16-to-12 on the offensive end, but the guests committed two dozen turnovers, 14 more that Eastern. The hosts combined for 15 steals, 14 assists and one rejection, while the Lady Tomcats had nine steals, eight assists and one blocked shot. EHS senior Kelsey Casto led the victors with 13 points and eight rebounds. Olivia Barber was next with 12 points and seven rebounds, followed by Alyson Bailey with 11 points, including three from long range. Ashton Guthrie made a pair of three-pointers and finished with eight markers, while Jess Parker came up with six points and a game-high five assists in the win. Kennadi Rockhold rounded out the EHS tally with three points. Bailey led the Lady Eagle defense with six steals, while Barber added three steals and a block. Jayne Six and Laikyn Imler led the guests with 14 points apiece, with Six marking 14 rebounds and three assists, and Imler adding eight rebounds and four steals. Emily Young tallied 10 points for the Lady Tomcats, Skylar Moore added three, while Brianna Orsborne came up with two. 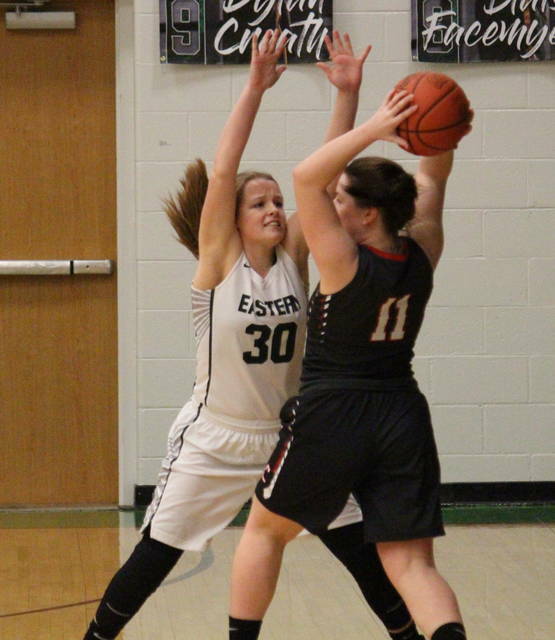 This marks the season sweep for EHS, as the Lady Eagles won by a 46-39 tally on Dec. 13 in Glouster. 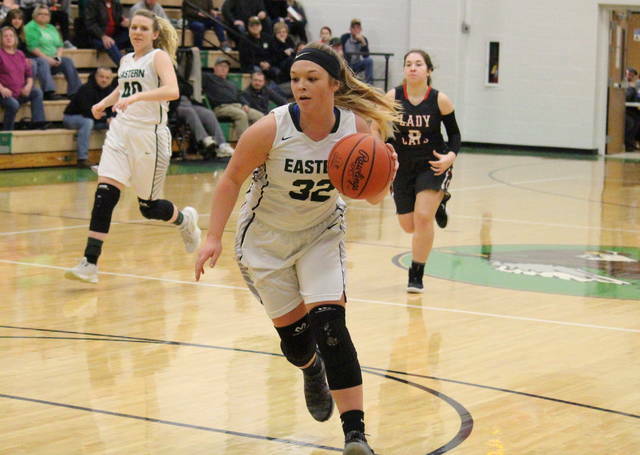 After a trip to Fairland on Saturday, Eastern will be back in ‘The Nest’ against TVC Hocking leader Waterford on Monday.